While it’s true that on the iPhone you often see only one view at a time, on the iPad you get to see two views, courtesy of the Master-Detail Application template (and something called a split view controller. Take a look at this figure. The view on the left displays what is called the master view. While technically it could be any type of view you’d like, in the case of the Master-Detail Application template, you get something called a table view, which displays a list of what is referred to as cells, entries, or rows. On the left side of this figure, you can see that tapping the + button shows a timestamp (in Coordinated Universal Time [UTC], the primary time standard and the successor to Greenwich Mean Time [GMT]) in the first cell in the master view. Tapping that cell, as illustrated on the right side of the figure, the same timestamp is displayed in the detail view and the cell is highlighted in the master view. All the detail view does right now is display “Detail view content goes here.” Well, that’s not all it does. 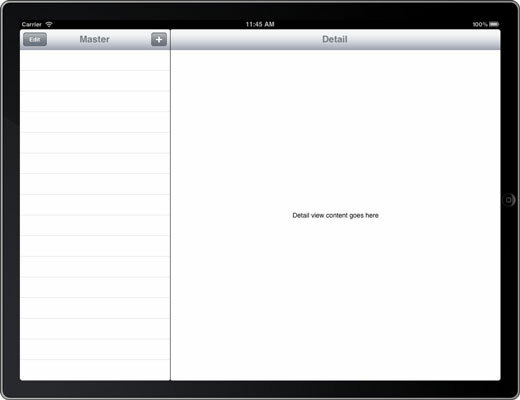 When you rotate the iPad into portrait mode, it’s also responsible for both displaying a nice Master button as well as for displaying the master view in the popover that you see when you tap the nice Master button. In landscape view, the master view on the left side also includes a toolbar with Edit and + “bar button items” that allow the user to modify content in this particular example program.